The Dubliner said that Team Europe would benefit from continuity following their success at Le Golf National last weekend. 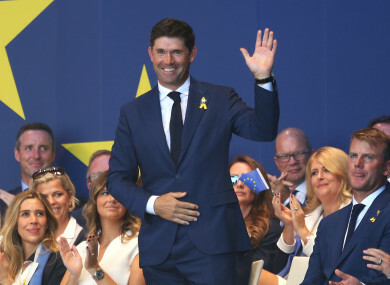 Harrington was a Vice-Captain for Team Europe for the 2018 Ryder Cup. PÁDRAIG HARRINGTON HAS said he is open and willing to the opportunity of captaining Team Europe at the 2020 Ryder Cup in the United States, following a successful bout as Vice-Captain at Le Golf National in Paris last weekend. The Dubliner said that his profile in the US would be an asset to Team Europe in two years’ time at Whistling Straits, and said that he would be interested in taking on the role “for the good of the team”. Admitting that securing Europe’s first victory on foreign soil since 2012 would be a major undertaking, Harrington said that he would still relish the opportunity to lead as team captain in Wisconsin. “No-one wants to be a losing captain,” he said speaking to Off the Ball on Tuesday. “There’s no doubt that you’ve a better chance at home. You get more involved at home, you’ve no say when it’s away. But saying that, I think the guys in the team would like continuity. “I think the Vice-Captains who were there [in France] look like they will be captains and around the team for a while to come. It was a very nice mix, right down to guys like Robert Karlsson, in terms of his diligence. He did a lot of the hard work in stats and things like that, making sure we were up-to-date. Somebody like Robert looks like he could be there forever. The players really appreciated the Vice-Captains, so I think they are looking for continuity. As regards to me going to the States — I think to give the Europeans the best chance it would look like they would line me up for the next one, because of my profile in the States. Harrington was a successful Vice-Captain under Thomas Bjørn alongside Luke Donald, Graeme McDowell, Lee Westwood and Karlsson in Paris last weekend, and the Dane has recommended the Irishman for the position in two years’ time. Padraig Harrington thinks he might captain Team Europe in 2020 "for the good of the team." Would he succeed? Harrington added that while he was not undecided on whether or not he wanted to take over as captain at Whistling Straits — which he described as a “European-style” golf course — he did not want to make any presumptions. “That is another difference,” he said when asked if taking on the captaincy would impact his playing privileges over the next couple of years. “If you go to the US, you have a lot less to do. If you’re in Team Europe you really have to give up everything you’re doing. Email “'The guys would like continuity' - Padraig Harrington open to captaining Europe at 2020 Ryder Cup 'for the good of the team'”. Feedback on “'The guys would like continuity' - Padraig Harrington open to captaining Europe at 2020 Ryder Cup 'for the good of the team'”.